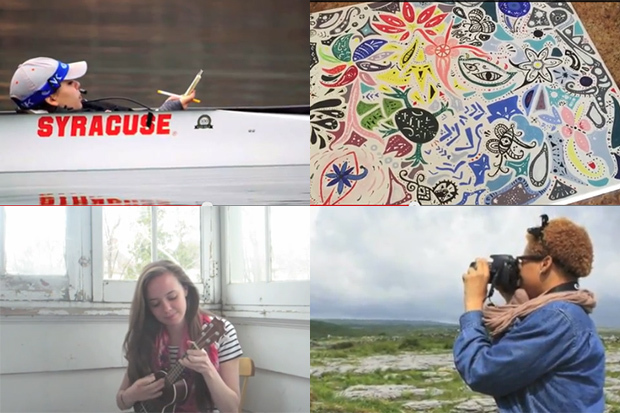 Newhouse graduate students in Corey Takahashi’s “Web, Mobile and Interactive Magazine” class made videos about their lives. You name it, Newhouse students have written about it: schools, government, trends, the weather, food, music and on and on. Lately though, assistant magazine and communications professor Corey Takahashi has been assigning a story topic that for many students is entirely new: themselves. As part of his MAG 500, “Web, Mobile and Interactive Magazine” class, Takahashi assigns the students to produce a one- to three-minute autobiographical video. The purpose of the assignment is twofold, he says: it forces the students to tell their own story and create a finished product that can be a great marketing tool in the highly competitive job market. “While many students are skilled in telling the stories of others, they’ve rarely produced a story about themselves, with the benefit of constructive feedback from peers and a professor in class,” Takahashi says. When produced well, a student’s bio video gives potential employers a unique look at the student as a job candidate, and it proves the student has video and storytelling skills. Takahashi requires the assignment of his graduate students and it is an optional makeup assignment for undergrads. He says students usually approach the video first thinking about what’s on their resume. He encourages them to think more about their “whole story” and what narrative can be told in a few minutes. Many students in their videos talk about where they grew up. Others include details about influences in their lives: books, music, art, internships. Takahashi tells students to think about “what would make an interesting conversation if you were having lunch with an editor.” That advice has led students to include their own ukulele music, footage of what growing up in a tough neighborhood looks like and emotional details of a sick parent. And while the students tend to find the assignment challenging, they come away from the experience with new skills and a video to use in the job market. They learn as much about themselves as Takahashi does, he says.